Just finished another tool, this time a froe for splitting wood. One of those tools I wanted to make, not needed, wanted, love the simplicity and the effectivity of it. It’s made from the runner of an old Swedish sled (sparkstøtting). 1. The froe in action. 2. Antique Swedish sled runner steel in the forge. 5. Turning a wood handle. 6. Ready to go in to nature and split wood. Hope it can give you a reason to make tools. I like to see that traditional way of making tools. I want to make one too. Donʻt need it. Probably would never use it. But itʻs a cool tool. Thanks for sharing. I’m always amazed at the breadth of your work. Now I want to try some blacksmithing. Well done. I found a guy to make one for me from a truck spring. I was in a hurry and paid $50 for it befor checking it out. He said he had made them befor and was a friend of a woodworker friend of mine. He has it curved and razor sharp. I then bought a proper froe from Lee-Valley also for $50. As you know it should not be so sharp as it must split along the grain and not sever the fibers. It also should be straight. Yes I can take out the sharpness, but without a forge it would been tough for me to straighten it out. I am happy to see you made a proper one. Great job. I have been recently looking into these and you made one on your own. Well done. Fantastic. Amazing what you can do in your small shop. You will be getting a lot of use and enjoyment out of that froe Mads. I got into log splitting when I first got into wood turning. It never ceased to amaze and satisfy me how straight logs can be split using just wedges. The froe is of course much more accurate in the right hands. 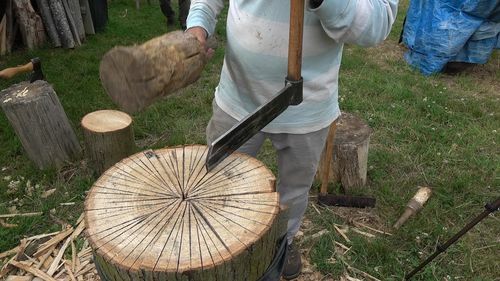 I’ve been watching some of those English bodger videos on Youtube where they are used a lot and it’s pretty impressive what they manage to do with them. Have fun! Another fantastic tool build. Nice job Mafe. Lovely job you made of that Mads, but you are going to ruin that nice mallet if you use it to hit a froe. Go cut a branch, throw it in your shavehorse, grab a drawknife and make a Fred Flinstone club like the one this guy is using. Very nice work on that froe! Mads, You are a true blacksmith! !